When I'm in Boston I will be working with one of my professors or tinkering away at the Imagineering Lab or exploring. And when I'm at home, who knows what I'll be doing. But this summer will be a good summer. Shall I make goals like I did last summer? No, I don't think I will this year. I kind of want to just wing it this summer. When I'm working on my Professor's project, I want to be really focused, and make it as much of a learning experience as possible. And when I'm not working on my Professor's project, I want to be having fun! I want to also make things! Yesterday, I was in Boston very briefly. I was sitting on a bench on Bay State Road, in the middle of the Boston University Campus, minutes away from any location on campus. And it felt great. The weather was great. The view was great. Here's to a great summer! I'll report back at the end of it, maybe. 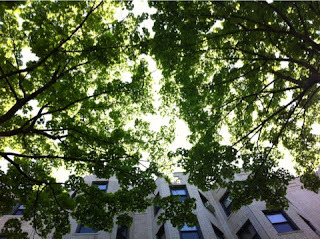 When I looked up yesterday, I saw this: a canopy of leaves with sunlight poking through! I'm such a natural light person!